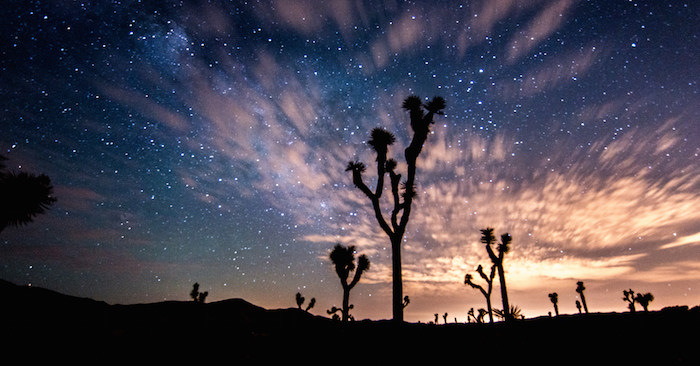 The dark night skies of the California desert, one of the most unique and pristine places in the United States, are under threat. But you can help! We urge you to contact President Barack Obama and Secretary of the Interior Sally Jewell to act now to designate three remarkable areas in this threatened landscape – Mojave Trails, Sand to Snow and Castle Mountains – as U.S. National Monuments. Mojave Trails is the ‘connective tissue’ linking Mojave National Preserve to Joshua Tree National Park and existing Wilderness Areas, providing vital habitat for sensitive wildlife, and unspoiled desert vistas. Sand to Snow protects some of the most diverse habitat in the country, linking the San Gorgonio Wilderness to Joshua Tree National Park and the San Bernardino National Forest. Castle Mountain protects some of the finest Joshua tree, piñon pine, and juniper forests in the entire California Desert Conservation Area and has stunning views of Nevada’s Spirit Mountain, which is revered by southwestern Native American tribes and listed on the National Register of Historic Places. These designations will significantly expand protections of the desert’s natural beauty, including the integrity of its natural nighttime environment. Americans and visitors the world over have long been drawn to the California desert’s stark beauty, painted mountains, iconic Route 66, fascinating wildlife and Native American petroglyphs. Yet, the desert is being squeezed by two of the fastest growing metropolitan areas in the nation, Los Angeles and Las Vegas. Sensitive water resources, popular recreation areas, crucial wildlife corridors, and historic sites are all at risk of being lost forever. As the region’s population continues to grow, new development brings invasive outdoor lighting, threatening stunning views of the Milky Way and the integrity of the desert’s natural nighttime environment. These lands deserve designations that recognize their astronomical, scenic, ecological, cultural, and economic importance, and that will preserve these resources for the benefit of all Americans. For decades, U.S. Senator Dianne Feinstein has worked to ensure this amazing landscape gets the protection it deserves. More than 20 years have passed since Congress adopted Senator Feinstein’s California Desert Conservation Act, creating Mojave National Preserve and elevating Joshua Tree and Death Valley to National Parks. After two decades of unsuccessful efforts to get Congress to pass comprehensive legislation protecting the California desert, Senator Feinstein has asked President Obama to issue three executive orders, designating these areas as National Monuments. We now have a unique opportunity to help protect the California desert for current and future generations. The best way to bring these southern California places and their gloriously dark night skies under permanent conservation is to create a new, protected federal status for them. IDA signed on to a joint letter with many southern California environmental groups and organizations asking the President and Secretary to designate these remarkable areas as National Monument and defend their remarkable night skies for generations to come. You can be heard, too! Below is a brief description of the proposed monuments, a sample letter and contact information. You can make a difference. Tell President Obama and Secretary Jewell today that you want them to designate these areas a National Monuments to protect the precious resource that is the California Desert. I respectfully request that you act swiftly and use the 1906 Antiquities Act to create the Sand to Snow, Mojave Trails and Castle Mountains National Monuments in the California desert. Time is running out to create these new National Monuments and we need your help! I believe that the new National Monuments will protect invaluable and increasingly threatened night sky resources in California’s Colorado and Mojave Deserts. The protection of the night sky is of paramount importance to human health, ecology and ecosystems, and our tourism economy. The designation of the proposed National Monuments will help protect the night sky resource in perpetuity for future generations.